Spiky balls are the best! 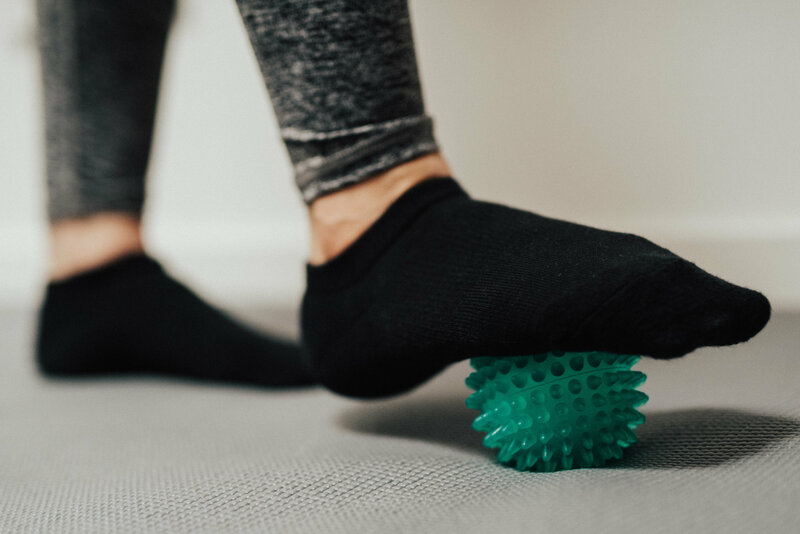 Did you know that spiky ball self treatment can boost blood flow to the area, stimulate the tissue, roll through trigger points and assist with muscle rehabilitation? You may have heard of, seen or used a spiky ball in the past. You may have one sitting in the cupboard but aren’t entirely sure what to do with it… keep reading and let me answer some questions for you. Spiky balls are exactly that, a small firm plastic ball that is covered in small spikes. These spikes aren’t as scary as they sound, they do have rounded edges to target those hard to reach areas. Spiky balls can also be referred to as massage balls. They are used at home by a lot of our clients as a way to prevent and treat trigger points throughout the body. What does a spiky ball do? Spiky balls treat the muscles in many ways. They promote blood flow to the area which encourages the tissue to relax. Through stimulation they also draw the brain’s attention to the area that it may have been neglecting or subduing. And as I said before, they work on trigger points that may be the source of pain. What is a trigger point? A trigger point is the focal point of a taught band of muscle fibres, what is more commonly referred to as ‘a knot. They are the most common cause of muscular pain in the body. Trigger points form for many different reasons and there are many different techniques for treating them. One of which is spiky balling. How do I do it? The beauty of a spiky ball is that it’s light, small and all you need is the ball and your body. (Which makes them ideal for travel!) Depending on the area of your body that you are treating, you would either place the ball on the floor or against a wall and lean your body weight into it. It doesn’t need to be a super painful experience! If anything, it should feel pretty good! Generally the area only needs to be treated for 60 seconds or so. Remember, you are not trying to tenderise your muscles! It’s better to start light and gradually ease into it more each time, than to try to pummel your poor muscles on the first try! Where do I do it? The areas that you require will depend on your specific needs.. These ones are my favourites..
Glutes: This is one you can do either on the floor or against a wall. I prefer against the wall as you have more control on how much pressure you are applying. You can roll the ball up and down the tissue and also across from side to side. You don’t need to do more than 60 seconds per glute. Upper back: The upper-thoracic region feels amazing to spiky ball! Once again, I prefer this one against a wall. If you place the ball between your shoulder blade and your spine, you can roll up and down and side to side. This one is great for office workers and people who get aches and pains through their shoulders. Foot: If you place the ball on the floor and put the sole of your foot on the ball. You can roll the ball along your plantar fascia and through the intrinsic, hard to reach muscles of the foot. We have a spiky ball in each of our treatment rooms to demonstrate any spiky balling for you if necessary. We also sell spiky balls at reception. If you have any questions or wish to know more, please just ask!